The interest and use of containers is exploding, and for good reason. Containers represent a new level of abstraction that elegantly solves the problem of how to get software to run reliably across multiple computing environments. Unlike virtual machines (VMs), containers virtualize at the operating system level and allow multiple containers to run on the same OS kernel. 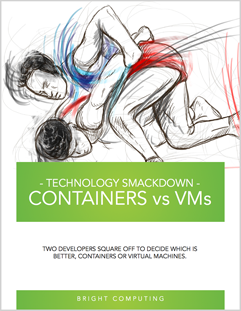 This makes containers smaller, faster to instantiate and lighter weight than VMs. While containers offer a number of advantages over virtualization, deploying them reliably can bring its own challenges. Provisioning and configuring the underlying servers, deploying and managing container orchestration frameworks like Kubernetes and monitoring all of that infrastructure can create real headaches for IT administrators. 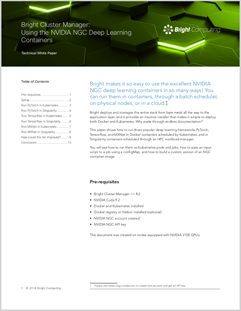 Bright Cluster Manager makes it easy for you to deploy container technology, whether you choose Docker or Singularity runtime engines, or Kubernetes container orchestration. Using Bright Cluster Manager to manage your container infrastructure and frameworks eliminates hassles and complexity, and allows you to fire up containers alongside other applications within a Bright-managed cluster. Bright Cluster Manager for Containers makes it easy to allocate some or all of your server infrastructure to running containers, and change that allocation dynamically as demand for resources changes. The result is an efficient clustered infrastructure with high utilization rates, regardless of what kinds of jobs your user community needs. Want to see Bright Cluster Manager in action?